Edo Japan is unveiling a new in-store concept: Edo Japan Fresh Take. The Fresh Take concept includes a new revitalized store design and layout with refreshed branding, on-trend menu evolution and a grab-and-go market wall with sushi, salads and Japanese-inspired snacks and treats. Going forward, all the new Edo Japan locations will feature this new Fresh Take layout and in-store offerings. While the well-loved dishes like Teriyaki Chicken and Sukiyaki Beef will remain as mainstays on the menu, Edo is introducing new offerings such as the Noodlefull and Chop Chop Bowls, as well as imported snacks. The new concept was developed with the intention of targeting millennials, while continuing to appeal to the wide range of customers who dine at Edo. The Fresh Take concept will fulfill the needs of the modern consumer as a health-conscious and high-quality alternative to fast food with a variety of fresh and healthy options in meals and beverages, and a focus on transparency when it comes to ingredients and meal preparation. Edo’s Shawnessy location is one of the first two stores to feature this new concept, with over 120 locations across Western Canada set to eventually follow its lead. The first Fresh Take location opened at North Town Centre in Edmonton earlier this year. With plans for expansion in Eastern Canada also in place, new locations in Manitoba and Ontario will incorporate the Fresh Take concept as they begin to open later in 2018 and beyond. To celebrate the launch of Fresh Take in Calgary, the Shawnessy store will be hosting a grand opening event all day on Saturday, March 17 with half priced Teriyaki meals, face painting, the Edo Ninja mascot, and the chance to enter to win one of two gift Edo baskets. Guests are invited to attend the celebration at the newly renovated location at 120, 296 Shawville Boulevard SE. Hours of operation are 10 a.m. to 10 p.m. Monday to Sunday. Thanks to Edo Japan and Brookline PR, I have one (1) $25 Gift Card from Edo Japan to giveaway. The lucky winner will have an opportunity to go and check out one of the Edo Japan locations and enjoy some of their classic favorites or new menu offerings. To enter into this draw for the $25 Edo Japan Gift Card, simply leave a comment in the section below telling me “Which is your favorite menu item at Edo Japan?”. 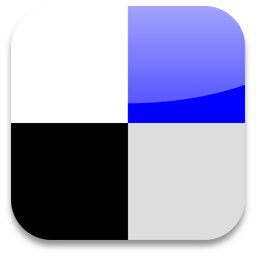 You will need to put a valid email address in the appropriate box when telling me about the menu item (not to worry, your email address will not be published), so that I can contact you if your name is drawn. This giveaway contest will close on Friday, March 16, 2018 at 11:59AM MDT. I will hold a random draw and one winner will be chosen. I will contact the winner via e-mail as well as post the name of the winner here. For more chances to win, you can check out my Instagram @miss_foodie. On a recent visit to Edmonton, my friend and I were treated to a family-style feast hosted by SABOR Restaurant and Bonafide Media & PR. 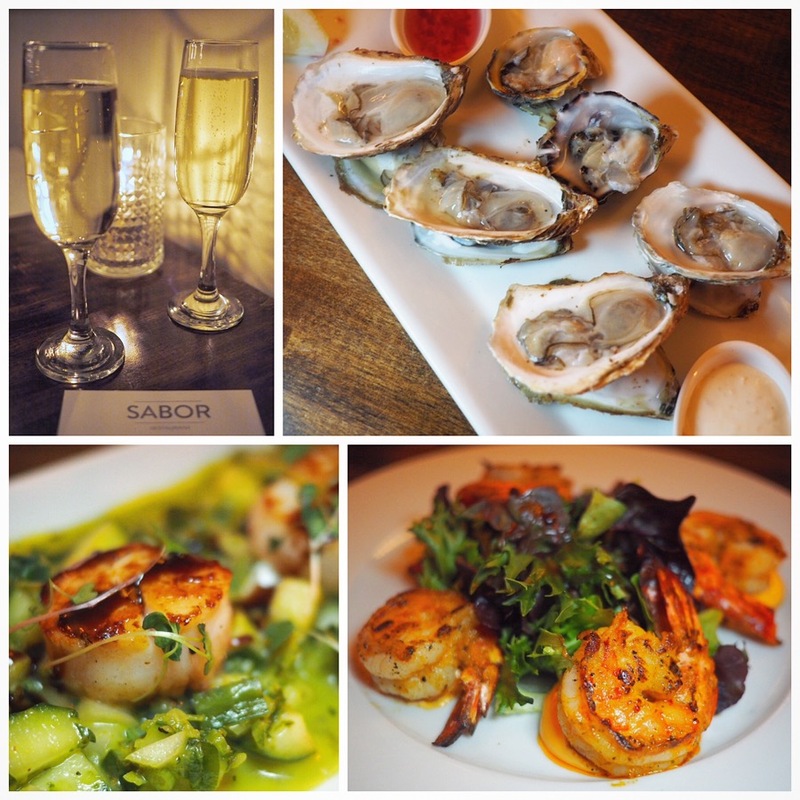 Located in the heart of Edmonton’s downtown, SABOR features the flavours of Iberian (Portuguese/Spanish/Mediterranean) coastal cuisine using hand-selected sustainable Ocean-wise seafood. The Family-style at SABOR ($55 per person) consists of a three course feast prepared by Chef Lino based on seasonal ingredients and daily inspirations. We started off this epic dinner with some bubbly paired with fresh shucked Kusshi & Irish Point Oysters. 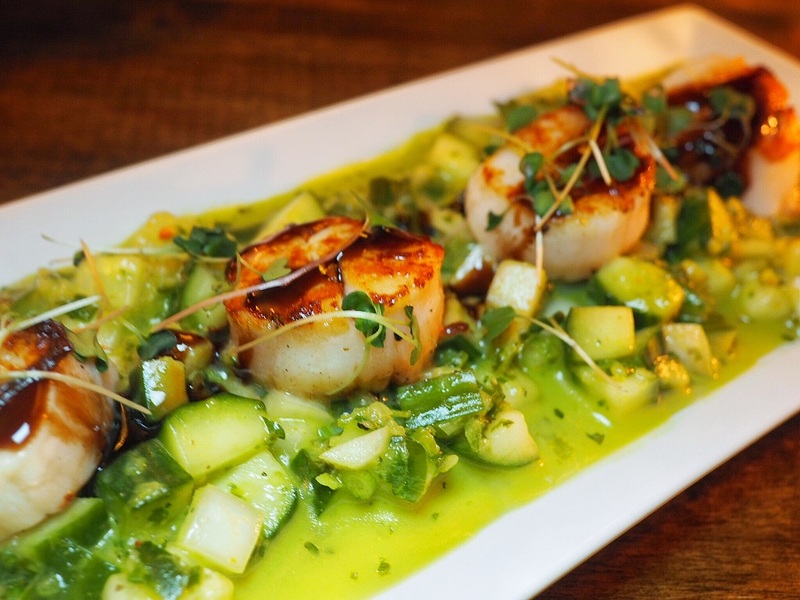 Next up were the perfectly Seared Scallops with a refreshing cucumber salsa & balsamic glaze and the amazing Grilled Piri Piri Prawns with mixed greens & piri piri aioli. 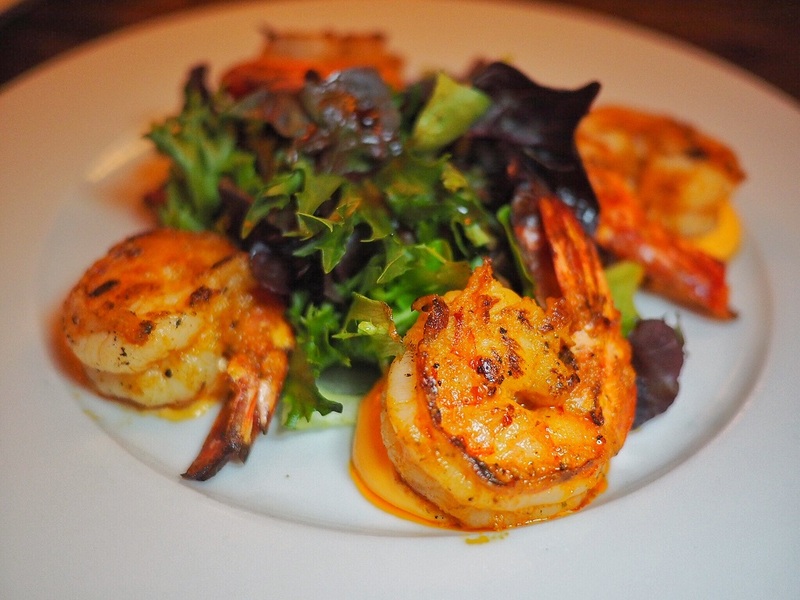 Being a spice fiend, these flavourful Piri Piri Prawns were my favourite bite of the night. 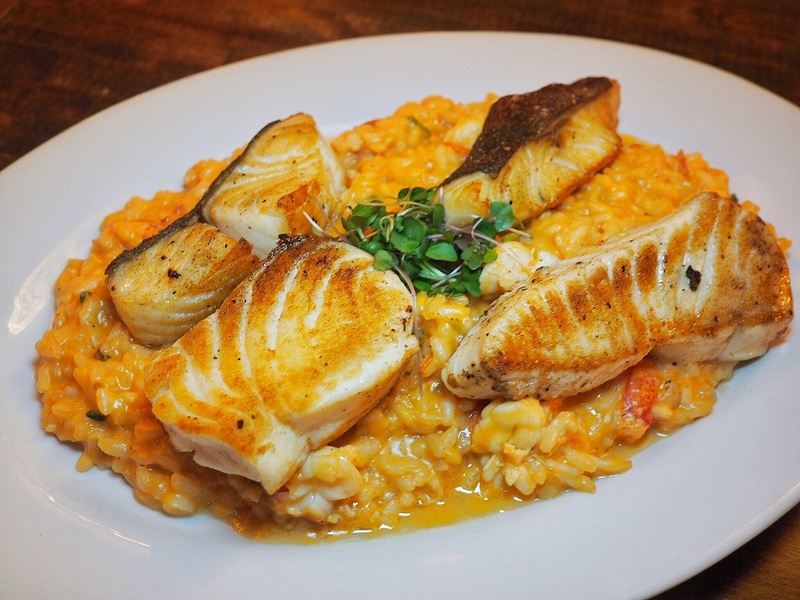 For our main course, we had a fantastic Lobster Risotto with buttery, melt-in-your-mouth Sablefish and Halibut. I was really impressed with how perfectly cooked the risotto was. We finished off our Family-style Seafood Feast in epic fashion with a trio of their decadent housemade desserts – Whipped Cheesecake with sour cherries in port; Leite Creme “DONA IRENE” (Portuguese Cream Custard with caramelized sugar and cinnamon); and Chocolate Cayenne Mousse. If you do have a chance to visit SABOR, I would highly recommend you try their Family-style Feast. For my friend and I this was definitely the perfect way to cap off our girls weekend in Edmonton. 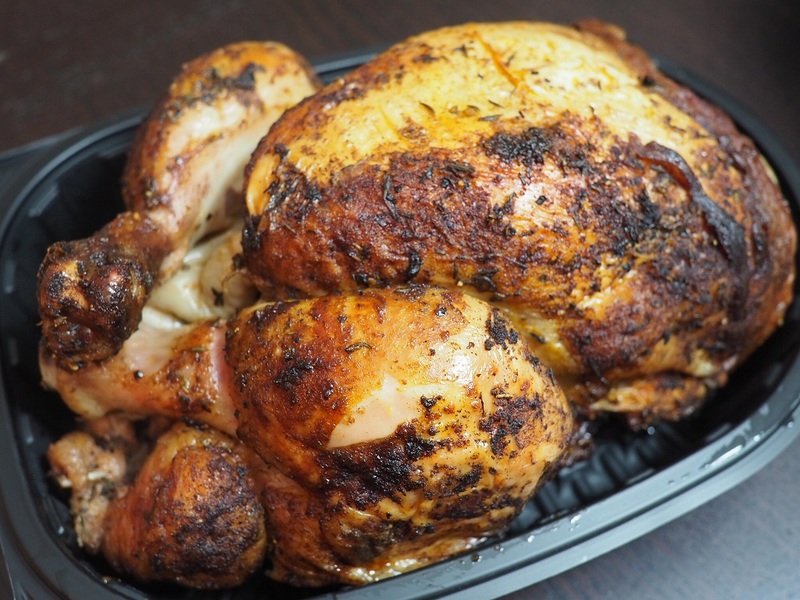 If you didn’t know already, both NOtaBLE and The Nash have been serving up some of the best wood fire rotisserie chicken in town. You can enjoy these succulent free range Happy Chickens while dining in at either of the restaurants or as part of their Gourmet 2 Go option. 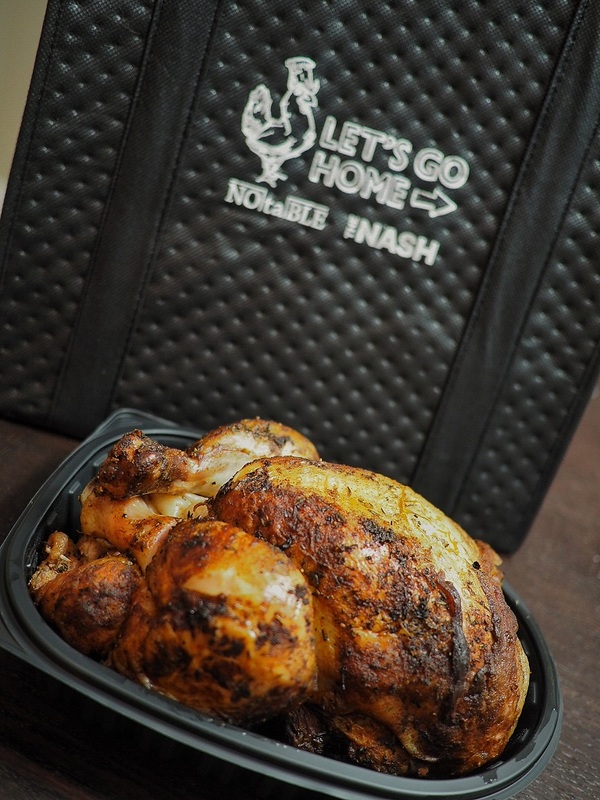 With the chilly wintry weather now upon us, NOtaBLE and The Nash restaurants have recently launched their Let’s Go Home loyalty program, encouraging customers to take their famous happy chickens home with them. 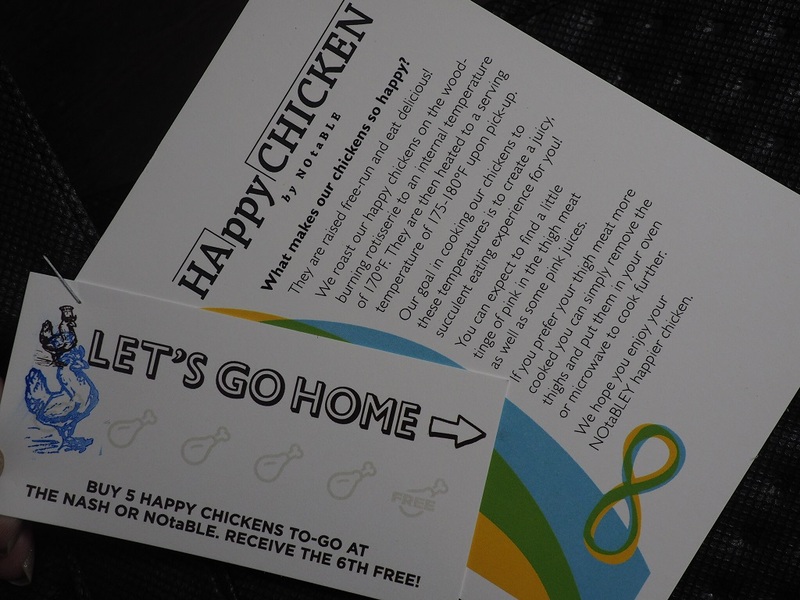 For every happy chicken ordered from their Gourmet 2 Go menu, customers will receive a stamp on their Let’s Go Home loyalty card. For every 5 happy chickens purchased, customers will receive a free happy chicken! Let me tell you, one of these Happy Chickens along with a few delicious sides makes for a great hearty and healthy dinner at home by a warm cozy fire. You can just drop-in to pick up one of these happy chickens for dinner or alternatively, for your convenience, if you prefer to avoid any wait time, you can pre-order your happy chickens at either restaurant with a requested pick-up time Tuesday-Sunday, from 4:00 p.m. – 7:00 p.m.
A couple of week ago, I went to check out Street Eatery, located in the west end of downtown. I would never have heard about this place if it were not for the invite that I received from Alchemy Communications to try out this little restaurant. Street Eatery serves up globally inspired street food using fresh, seasonal and local ingredients, with vegetarian and vegan options too. Street Eatery is well-known for their “Street” Shakes, which are milkshakes garnished with all your favourite sweet treats. We indulged ourselves and tried two of these sweet concoctions. The first was the Salty n’ Sweet ($14), which consisted of a salted caramel peanut butter shake with a chocolate frosted rim with chocolate gems and peanut butter cups and was topped with a Twix bar, salted caramel cream puffs, mini pretzel sticks, whipped cream and chocolate & salted caramel drizzle. As well, we tried the Berry Crush ($14), which was a mixed berry shake with a citrus frosted rim with sour gummies and nerds, and was topped with a pixie stick, sour skewer, whipped cream and cotton candy. These shakes are definitely a meal in itself and guaranteed to give you a sugar rush! From the food menu, we started off sampling the Macaroni Makhani ($8; option to add chicken for $4), which consisted of cavatappi pasta baked in a spicy tomato infused cheese sauce with flavours that reminded me of Butter Chicken. Next up was the King Tostada ($12), which was served on two crunchy corn tortillas with a choice of chicken, pork belly or sautéed shrimp. Of course, we chose the pork belly! The tostadas were topped with refried beans, pico de gallo, roasted corn, romaine lettuce, cilantro, feta and finished with a chili lime aioli. For our second entrée, we tried the Don Torta ($13), with grilled chicken, pork belly, refried beans, pico de gallo, romaine lettuce, guacamole, jalapeno cream cheese, and spicy mayo atop a warm soft ciabatta bun. For our side, we chose their house made thin-cut potato chips which were top-notch and highly addictive. Overall, this visit to Street Eatery was a fun experience and I definitely won’t forget the sugar high I got from those “Street” shakes. With the festive season almost in full swing now, Edo Japan is celebrating the holiday season with ‘Simply Better’ giving by launching their ‘Edo a Little, Help a Lot’ campaign. 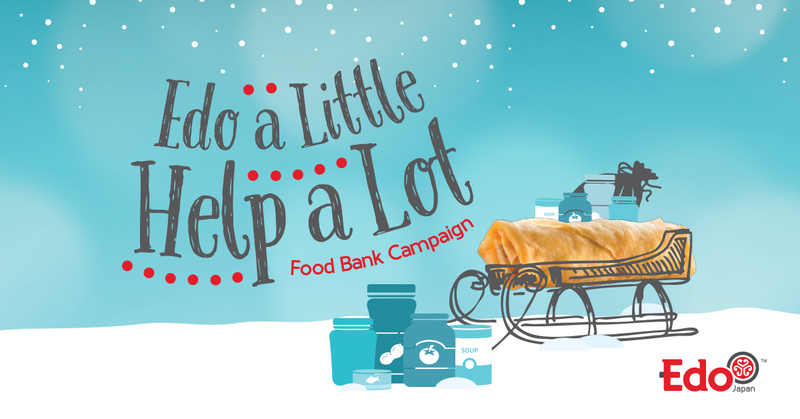 Edo Japan will once again be supporting Canada’s food banks by donating 25 cents to local food banks for every spring roll sold during the holiday season. Last year, Edo raised over $74,000 to help food banks across Canada. It’s more important now than ever to give back, with over 850,000 Canadians using the food banks each month. New this year, Edo is introducing a ‘Double Up Day’ on December 10 – a one-day event where Edo will be doubling donations (from 25 cents to 50 cents) to local food banks for each spring roll sold. Known for its signature dishes, including Teriyaki Chicken, Sukiyaki Beef, and a full sushi offering, Edo Japan prides itself in providing delicious, affordable and ‘Simply Better’ fresh nutritious meals to its customers. Thanks to Edo Japan and Brookline PR, I have one (1) $25 Gift Card from Edo Japan to giveaway. The lucky winner will have an opportunity to go and check out one of the Edo Japan locations and enjoy some of their ‘Simply Better’ offerings. To enter into this draw for the $25 Edo Japan Gift Card, simply leave a comment in the section below telling me “Which is your favorite menu item at Edo Japan?”. You will need to put a valid email address in the appropriate box when telling me about the menu item (not to worry, your email address will not be published), so that I can contact you if your name is drawn. This giveaway contest will close on Saturday, December 10, 2016 at 11:59PM MST. I will hold a random draw and one winner will be chosen. I will contact the winner via e-mail as well as post the name of the winner here.